If you suffer from chronic pain and often light a cigarette to deal with it, we would like to very simply ask you not to do this. About 18% of people in the United States are smokers, according to the Centers for Disease Control and Prevention. But it’s interesting that smokers make up more than 50% of patients who seek pain treatment. Quitting smoking may be one of the most significant things you can do to both improve your health and manage your pain. 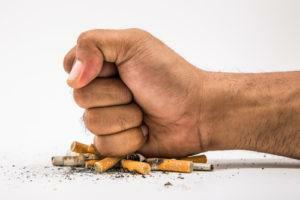 Smoking is one of the big picture medical factors when it comes to pain. The nicotine in tobacco tricks the body into feeling better, but only initially. It triggers the release of chemicals, like dopamine, which give off a satisfying sensation. This is what makes smoking so addictive. Nicotine is also a pain-killer, but again, the short term effect is overwhelmed by the long term impact on pain and health in general. To work efficiently, your muscles and joints need a steady supply of oxygen-rich blood. Smoking tightens your arteries and decreases the rate at which oxygen and carbon dioxide are exchanged in your blood. Decreasing blood and nutrient flow can cause degeneration, particularly in discs of the spine, which already have more limited blood flow. The result can be lower back pain and sometimes osteoporosis. Researchers from Northwestern University released the results of a study that linked smoking with chronic back pain. This is the first study to reveal that smoking interferes with a brain circuit connected with pain, making those who smoke more susceptible to chronic back pain. The study tracked 160 adults with new cases of back pain, and found that smokers are three times more likely than nonsmokers to develop chronic back pain. The study also revealed that those who quit smoking decreased their chances of developing chronic back pain. Physicians also link smoking with fatigue and slower healing. These factors can make painful conditions more prominent. Researchers are currently exploring other physiological reasons why smoking makes people with fibromyalgia, arthritis, and other chronic pain hurt more. Another important factor to note is that smokers aren’t typically good candidates for surgery. If you need an implantable device to help with your chronic pain, smoking makes it much more difficult to fight off potential infection from surgery. We know it isn’t easy to quit. But if you are a smoker, we implore that you make a commitment to trying to quit as it can make a significant difference is the success of treatment for chronic pain. We are happy to talk with our patients about potential medications and/or counseling options to help you quit. Take a walk, or do some other safe, healthy activity when you feel the urge to smoke. Smokers often assume that they’re mostly just hurting their lungs and increasing their risk of cancer, and while those are huge risks that should not be taken lightly, there is so much more to it than that. Smoking compromises almost every aspect of your health, and quitting can not only decrease your chronic pain, but it can increase your overall health and quality of life. With a multitude of pain relief options tailored to your specific needs, Southside Pain Specialists follow the standards of the American Society of Interventional Pain Physicians, The American Board of Pain Medicine, and the International Spinal Injection Society. We work hard to provide patients comprehensive, caring pain relief when they need it most. Check out our website or contact us today at 205.332.3155 to learn more.